Way back in November I started the process of making infused calendula oil, by collecting a bunch of calendula flower heads and setting them on a tea towel in our kitchen to dry. That was Step 1. For Step 2, I crammed all those heads into a glass jar and poured a mixture of almond oil and olive oil over the top to cover the flower heads. I sat that jar on a windowsill in full sun for a few days, and then transferred it to our dark pantry where it's been chilling out ever since. I'm happy to say that today I performed the third and final step of making infused calendula oil and the finished result is fabulous. Such a rich orange colour, lightly smelling of calendula petals and oh so beautiful on the skin. All I did for Step 3 was strain the oil through a sieve into a couple of separate jars and discard the used flower heads. Simple and oh so gratifying when I think what I paid for store bought calendula oil back when L was a baby. I've already used some of the infused calendula oil on S's nappy rash, and I plan to use lots more of it performing baby massage on our new baby, who is due in September. 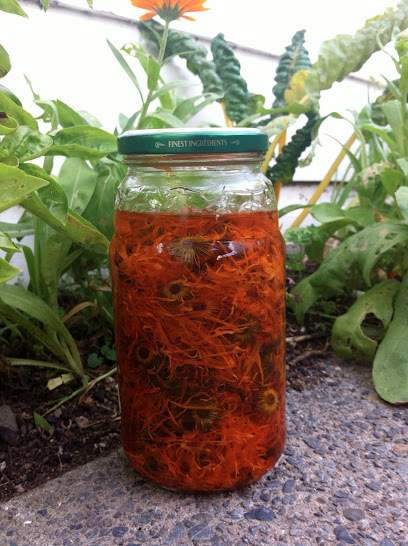 Have you ever made or used calendula oil? What do you use it for?